February 22, 2010 • As a spin-off of one of my projects I uploaded XL2XML.vbs, a script to convert a spreadsheet to XML. You can specify the Excel and XML file names and locations, the name of the worksheet, and/or the number of rows and columns to be read. By default it uses the first row as a header to name the XML tags, but you can override this default behaviour. By default the XML file will overwrite an existing file of the same name, but you can choose to let the script make a backup first. 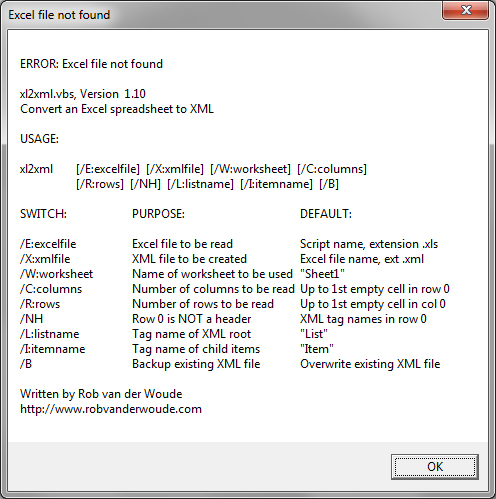 The script does not require Excel but uses my ADODB based ReadExcel( ) function instead. February 18, 2010 • It has been a while since I found my latest RUNDLL32 command. As you may have found out yourself, they're not that well documented. In an article by Scott Dunn, on WindowsSecrets, he explains how to switch between windows in Windows 7's Aero interface. Googling further I also found an article by Vishal Gupta presenting similar commands to turn on/off Windows 7's Aero interface. February 1, 2010 • Tom Hoff sent me a tip on debugging VBScript using a true debugger: by using CSCRIPT //X yourscript.vbs your script will be executed in a debugger (if available). January 18, 2010 • An update to Tim Knowler's SecStat.bat problem: contrary to my earlier assumption, the Security Center is still available in WMI for Windows Vista. • David Chisholm found that WMIC doesn't like dashes in computer names, as in /Node:MY-COMPUTER. His solution is simple, just use doublequotes, e.g. /Node:"MY-COMPUTER". This change has been implemented in SecStat.bat, and I'll soon update more scripts. January 13, 2010 • A little late perhaps, but still, I wish you a happy 2010. 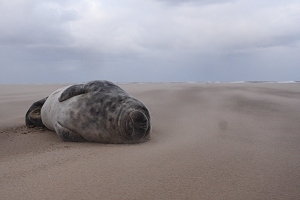 • I just returned from a short vacation on the beach... in England, lying on the sand with hundreds of Grey Seals. A wonderful experience. • Tim Knowler wondered why my SecStat.bat refused to run in Windows Vista. We did some investigations and found out that the SecurityCenter has been replaced by the Terido API, which is available for software vendors only, after signing a non-disclosure agreement. So it seems SecStat.bat will be available for Windows XP Professional only.